Quiet road off of Seaview Ave. 8/10ths of a mile to warm water Nantucket Sound beaches allows you to walk (15 minutes) or ride your bike (4 minutes). Just due west of Bass River. Queen bed in the master, bunk beds in the 2nd bedroom and a full pull out couch in the living room allows you to sleep 6 people comfortably. Kitchen provides a 4 burner stove, microwave and full size refrigerator. Picnic table and grill in the back yard allows you soak in the Cape sun. Don't feel like grilling? Take a walk to Skippy’s Pier 1, Captain Parks Pub (Voted #1 on the Cape for their Chowder), and/or Skipper Restaurant and Chowder House. After Dinner, walk to Jerry's Seafood and Diary Freeze for some ice cream. Want a beach break, Pirates Cove miniature Golf and Cape Cod Inflatable Park is just down the road. Linens can be rented or you may bring your own. New Hampshire natives that have always dreamed of owning a place on the Cape. We hope that your family will enjoy our condo as much as our family does! Great stay. This is a condo, so when you look at the picture the actually rental is half the house. We enjoyed the yard and picnic table. Quick drive to smugglers beach and all the restaurants & fun. This place served as an awesome home base for our trip. It's near a lot of stuff, and easy to get around the entire cape from here. It was very clean, albeit small. Huge hard is good for grilling. We had a wonderful stay! The cottage was perfect for a small family and walkable (0.75-1 miles) to several nice beaches. The kitchen was well equipped with all we needed. We were traveling with our baby, and the second bedroom was a good fit for the pack n play. Many great restaurants within a short drive-our favorites were Seafood Sam's and Keltic Kitchen. 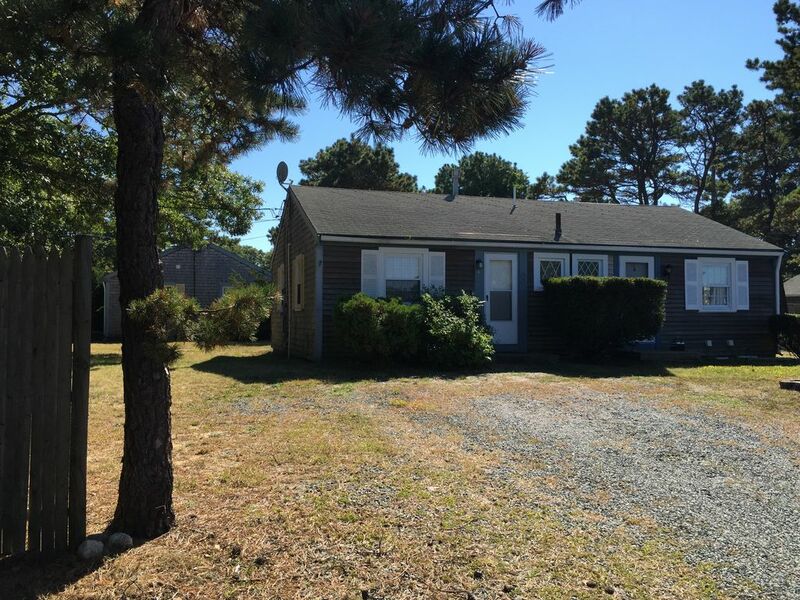 This is a great, affordable, pet-friendly home base for young families that will be spending their days at the beach and nearby attractions! Thank you for the great review! We are so happy you enjoyed your stay and time on Cape! Hope to see you again! Very convenient to shops, restaurants and beach. Nice home for a small family. If you are looking for a Cute and cozy vacation home you found it. Close to everything food,shops and of course the beach. Thank you Fragala family for opening your little piece of heaven and sharing it with us. My family and I loved it definitely will be going back next year. Thank you Eliana! We are thrilled you like the house and I hope we see you next year!! After such a nice experience here last year, we didn't even look anywhere else. Clean, nice size, quiet... just right. As nearly every review mentions, you are close to anything you could want. The yard is large, the cottage is comfortable, and the new AC unit works very well. Ryan and family make the arrangements simple. Thanks again ! Thank you Leah! It means the world to us that you have come two years in a row! We are so glad you enjoyed your stay! Hope to see you next year!! !